Media: Denise Cahill (Journalist), “The Guardian Express” (until approximately 8.25pm). Public: Approximately 18 members of the public. Mayor Emma Cole on approved leave of absence from 17 September 2018 to 12 October 2018. Cr Joanne Fotakis was an apology for the meeting. · Spoke against the recommendation urging Council to futher consider Alma Road for traffic calming and road safety strategies. · Requested that Council repair the footpath on Alma Road. · Raised concerns relating to saftey and crime on Alma Road. · Requested that Council install effective lighting on Leake Street, Alma Road and Claverton Street. The Presiding Member Deputy Mayor Susan Gontaszewski thanked Ms Brandon for her comments. · Stated that traffic calming measures should be considered for Alma Road. · Stated that traffic calming measures should be considered to discourage commercial vehicles from accessing North Perth Plaza via Alma Road. The Presiding Member Deputy Mayor Susan Gontaszewski thanked Ms Wilde for her comments. The Presiding Member Deputy Mayor Susan Gontaszewski thanked Mr Edenburg for his comments. · Reiterated Cancer Council’s concernes in relation to the application. · Requsted that the applicant provide evidence of the air filtration systems ability to remove all emissions from inside the venue and requested independent monitoring. · Requested that Council reject the application. The Presiding Member Deputy Mayor Susan Gontaszewski thanked Ms Ledger for her comments. · Stated that the venue is not considered a public place. The Presiding Member Deputy Mayor Susan Gontaszewski thanked Mr Iriks for his comments. There being no further speakers, Public Question Time closed at approximately 6.22pm. 4.1 Cr Dan Loden requested a leave of absence from 25 September 2018 to 28 September 2018 inclusive due to work commitments. That Cr Dan Loden’s request for leave of absence be approved. 4.2 Cr Dan Loden requested a leave of absence from 7 October 2018 to 13 October 2018 inclusive due to work commitments. · Stated that the property is not listed on the State Heritage Register. · Requested that Council include approval to retain the existing render on the front and side elevations of the property. · Stated that the removal of the render is cost prohibitive to the restoration of what was previously a derelict property. · Advised Council of the commitment to retain the heritage of the property. · Stated that the applicant is willing to work with Council. That the minutes of the Ordinary Meeting held on 21 August 2018 be confirmed. That the Minutes of the and the Special Meeting held on 11 September 2018 be confirmed as a true and correct record. The Greening Vincent Gardening Competition which has been running since Vincent became Vincent is on again this year. Entries are open to residents, ratepayers and businesses with property in Vincent and there are a number of categories; best business garden, catchment friendly verge, food garden, court yard, balcony and residential gardens. It is such a fantastic event to be part of and I would urge all the green thumbs out there to head to our website and find out more and submit their entry by 5 October. I would like to acknowledge that tonight is the final Council Meeting for our outgoing CEO, Len Kosova. Len, your achievements in the role speak for themselves and the change that you have led at Vincent has benefited both our City and the Local Government Sector. You have my absolute congratulations for being someone who both challenges and changes the status quo. It has been such a great pleasure working with you and I wish you all the very best as you step away to spend more time with family and explore other career opportunities. So on behalf of Council I thank you. Vincent will be welcoming David MacLennan who will be taking the post as Chief Executive Officer. David brings along a passion for people along with a substantive public sector leadership, project management and infrastructure management experience to the role of CEO. David will be commencing in October and we look forward to welcoming him then and continuing to deliver progressive, innovative, open and accountable Local Government. The Presiding Member Deputy Mayor Susan Gontaszewski invited Chief Executive Officer, Len Kosova to say some words to mark the occasion. It has been a real privilege to serve the community of the City of Vincent and it has been fabulous working with this Council and this Administration. The CEO is often responsible for taking more than their fair share of the blame and less than their fair share of the credit and I wouldn’t have it any other way. I would just like the thank the whole of the Administration for all of the support, encouragement and motivation they have shown while we have been on a very progressive change journey over the last four years. Thank you also and specifically to the Executive Team, it has been a great privilege serving with all of the Directors in investing an enormous amount of time and energy in always trying to do right by the community of the City of Vincent. It has been the one purpose and passion that I am pleased to say the whole organisation has shared, as we have focussed on a narrative of “Us and We” rather than “I and Me”. Thank you for the opportunity to be Vincent’s CEO. After 23 years in Local Government I am now looking forward to pursuing new opportunities. 8.1 The Chief Executive Officer, Len Kosova, disclosed a direct financial interest in Item 18.1. The nature of his interest is that it relates to his performance and remuneration in the role of CEO and his contract of employment with the City. 8.2 Cr Jonathon Hallett disclosed an impartiality interest in Item 9.2 – No. 45/87 (Lot: 45; STR 65963) Bulwer Street, Perth – Proposed Amendment (Operating Hours) to Existing Development Approval for and Eating House. The extent of his interest in this matter is that he has an association with the applicant. The association being that he resides in a property diagonally behind the premises in question, next door to where a noise sensitive receiver was located for the acoustic report. 8.3 Cr Roslyn Harley disclosed an impartiality interest in Item 9.4 – No. 3 (Lot: 47; D/P: 1177) Bulwer Avenue, Perth – Existing and Proposed Alterations to Single House. The extent of her interest in this matter is that she has an association with the applicant. The association being that the applicant is known to her through a mutual friend over a long period of time. 8.4 Cr Jimmy Murphy disclosed a financial interest in Item 11.2 – Authorisation of Expenditure for the Period 25 July 2018 to 21 August 2018. The extent of his interest in this matter is that Upbeat Events has been contracted to deliver parts of the Town Team Movement Conference. Cr Murphy did not seek approval to participate in the debate or to remain in Chambers or vote on the matter. 8.5 Cr Josh Topelberg disclosed a proximity interest in Item 9.6 – Amendment 1 to Local Planning Policy No. 7.1.1 – Built Form. The extent of his interest in this matter is that his family own a property at 346-352 William Street within the area subject to the William Street guidelines. Cr Topelberg sought approval to remain in the Council Chamber and participate in the debate only but not to vote on the matter nor to remain in chambers or participate in the debate relating to the William Street Guidelines attached to the policy. The Chief Executive Officer advised Council that in accordance with clause 2.17 of the Meeting Procedures Local Law and section 5.68(1) of the Local Government Act 1995 Council may consider and determine Cr Topelberg’s request to participate in the debate on this particular item notwithstanding his proximity interest disclosure, providing it does so while Cr Topelberg is not in the Council Chamber. At 6:44 pm, Cr Joshua Topelberg left the meeting. The Chief Executive Officer further advised Council that the nature and extent of Cr Topelberg’s interest would not be common to a significant number of electors or ratepayers, thus ruling out the application of item (II) above. · Cr Topelberg not being permitted to remain in the Council Chamber during debate or vote on the William Street Guidelines. At 6:51 pm, Cr Joshua Topelberg returned to the meeting. Items 9.1, 9.3, 9.4 and 10.4. Items 9.6, 11.2 and 18.1. 1.2 The alfresco dining area is only permitted to operate between 7:00am and 10:00pm. That Council AMENDS the City’s Trees of Significance Inventory by deleting the entry for “209 Brisbane Street, Northbridge – Brachychiton discolour (Lacebark)”. 3. ADVISES all respondents of its decision. That Council AMENDS Policy No. 3.10.11 – Community Funding to include Female Sports Participation Grants as reflected in Attachment 1. That Council APPROVES the Community Sporting and Recreation Facilities Fund Small Grants submission to the Department of Local Government, Sport and Cultural Industries for $25,000 towards the Leederville Oval Master Plan. That Council RECEIVES the Information Bulletin dated September 2018. 5. NOTES that Adminstration will inform the petitioners of the Council’s decision. 5.3 Adminstration will inform the Petitioners of the Council’s decision. All external fixtures and building plant, including air conditioning units, piping, ducting and water tanks shall be located so as to minimise any visual and noise impact on surrounding landowners, and shall be screened from view from the street, and surrounding properties to the satisfaction of the City. 6. Conditions that have a time limitation for compliance, and the condition is not met in the required timeframe, the obligation to comply with the requirements of the condition continues whilst the approved development exists. 7. Conditions that have a time limitation for compliance, and the condition is not met in the required timeframe, the obligation to comply with the requirements of the condition continues whilst the approved development exists. 3. The proposed development, in providing only two dedicated bays for up to 62 visitors, is not considered to meet the objectives of Council’s Policy No. 7.7.1 – Non-Residential Development Parking Requirements as appropriate parking will not be provided to meet the needs of users. For the reasons stated in Council’s decision, the proposed development was considered to have an unacceptable impact on the amenity of the locality. 8. All stormwater produced on the subject land shall be retained on site, by suitable means to the full satisfaction of the City. 9. Within 28 days of Council approval, the applicant is to submit details as to how the existing render on the side elevations will be painted in a colour complementary to the heritage of the place, in accordance with the City’s Policy No. 7.6.1 – Heritage Management – Development Guidelines for Heritage and Adjacent Properties, to the satisfaction of the City of Vincent. Within 28 days of the City’s approval of those details, the applicant is to paint the existing render on the side elevations, to the satisfaction of the City of Vincent. At 7:59 pm, Cr Jimmy Murphy left the meeting. At 8:03 pm, Cr Jimmy Murphy returned to the meeting. 3. NOTES that a further report will be submitted to Council at the conclusion of the public comment period in regards to any written submission being received. 2.2 That Administration will give notice of the proposed amendment to the Western Australian Planning Commission pursuant to Clause 4 of Schedule 2 of the Planning and Development (Local Planning Schemes) Regulations 2015. At 8:23 pm, Cr Joshua Topelberg left the meeting. At 8:23 pm, Cr Joshua Topelberg returned to the meeting. At 8:24 pm, Cr Jimmy Murphy left the meeting. At 8:25 pm, Cr Jimmy Murphy returned to the meeting. 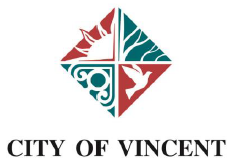 Pursuant to Section 5.23(2) of the Local Government Act 1995 and clause 2.14 of the City of Vincent Meeting Procedures Local Law, proceeds “behind closed doors” at the conclusion of the items, to consider the confidential reports. At 8.24pm the meeting went behind closed doors and live streaming was stopped. 3. NOTES that the CEO Performance Review Panel will continue to work with the appointed consultant to draft Key Performance Indicators for the next review period, to be presented to Council for approval within 3 months of the commencement of the new CEO. These Minutes were confirmed by the Council as a true and accurate record of the Ordinary Meeting of the Council held on 18 September 2018.